Niche: Helping SaaS to grow their revenue through sales training and mastering their sales methodology. 1. Where Pat was before joining Consulting Accelerator. 2. Pat’s unique step by step process he followed when he chose his niche. 3. The common pain points Pat identified and soon solved within SaaS companies. 5. The fear that drove Pat and gave him the confidence to package and price his offer to potential clients. 6. How direct outreach with LinkedIn and AngelList helped Pat generate strategy session calls. 7. Why Pat switched from a done-for-you service to a one-on-one coaching business. 8. The most transformative part of Consulting Accelerator for Pat and his plan for the future. Stop trying to have it perfect before taking massive action! Sam Ovens:	Hey everyone, Sam Ovens here and today I have Pat Lavergne on with us and Pat has an awesome story. He joined Consulting Accelerator about three months ago now and at that point when he joined, he had been working a corporate job and he had decided that he wanted to quit the corporate world and get into business for himself. 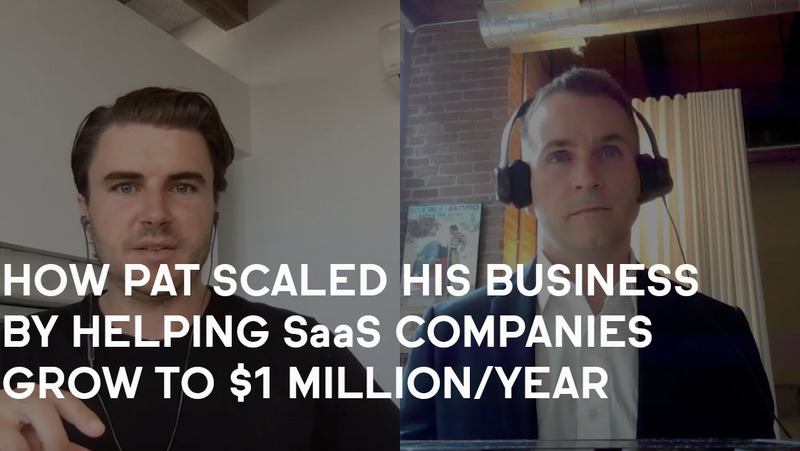 So he joined Consulting Accelerator, he quit his job and he decided to start his own consulting business helping SaaS companies, so software and service companies [00:00:30] to grow to $1 million per year in revenue through sales training and through really mastering the sales methodology. In this interview today we're going to discuss why Pat quit the corporate world, why he wanted a business, and then how he was able to start that business, why he chose SAS companies, why he decided to help them with sales and also, how he was able to get clients. [00:01:00] And how many clients do you have now? Pat Lavergne:	Right now I have five clients across two different models. So I'm kind of like switching models slowly as I go. Sam Ovens:	What do you mean by models? Pat Lavergne:	So I've started with done-for-you consulting where I would actually help my clients by doing things for them and now I've got ... So I got my first three clients that way and right now I'm transitioning to one-on-one coaching where I actually help the same niche, fix the same problem, [00:01:30] but just slightly in a different way. Sam Ovens:	Got it. And let's go back three months ago, how did you come across me and Consulting Accelerator? Pat Lavergne:	Aside from the fact that your retargeting strategy is pretty solid. Basically I left the company I was working for and I knew I wanted to consult. What was actually appealing to me was the freedom and [00:02:00] actually working on my own dream and my own goals instead of doing it for someone else. So consulting basically ticked all of the boxes. I could work from anywhere in the world, I could help the people that I feel I could bring the most value and I could really work on the perfect moment for my client, which is when they're just starting and they've released their product but they don't know how to bring it to market, which is the part that excites me the most. And yeah, so basically I started seeing [00:02:30] consulting.com popping up left and right to the point where I joined a webinar online, but that still wasn't enough for me. What really did it for me was reading ... Like one night I remember it was like 2:00 AM, couldn't fall asleep and I was reading, like I was going through all of the testimonials on your website and that's why I'm here today and I'm happy to lend my voice to that. And that's really what kind of convinced me to jump on board. Sam Ovens:	Why? Pat Lavergne:	Because I could see people were in [00:03:00] a situation very similar to mine, actually being successful following your teaching basically. Sam Ovens:	And how did you just scroll through the testimonial? Were you sorting them by any sort of category or mechanism or were you just looking at them randomly? Pat Lavergne:	I'd say the first five I just went like straight like as they were coming on my screen and then I started ... I kind of figured the idea of niching down and so I started trying to look for niche that could be interesting to me [00:03:30] even though at that time I had no idea who I would consult with, what's the value I would bring, which problem I was after. So it was like the first little exercise, I guess, before even joining the program for me. Sam Ovens:	Got it. And when you first joined Consulting Accelerator, the first step we get you to do is really figure out what you're interested in and what niche you want to work in. [00:04:00] How did you work through that process? Pat Lavergne:	That was a hard one for me. I was all over the place. I have a lot of interests, but not really one thing that really I'm passionate about. So I'd say that I follow the exercises and the program that helped me, but even then it took me ... Before joining the accelerator I was kind of at that point where I didn't know what to do. So at what point I really [00:04:30] leveraged the community that we have on Facebook, asking people how they kind of did that themselves and this is where I kind of did a little bit of soul searching. So trying to look at what interests me in trying to kind of like crisscross that with my expertise. So what I've already done, where I've already provided value. And then trying to figure out which problems are out there that I could help on and I wanted to help on, but which problems are really the most pressing or the most urgent or important for people, because I learned that if [00:05:00] I were to attack a problem that was really like keeping people up at night, then I could probably make a better living out of that. Sam Ovens:	Got it. And then, why SaaS companies? Pat Lavergne:	Basically my previous job, that's the environment I was in and it's an environment that I like and I thrive and I understand. So that's one thing. The second thing is I know a lot of people who built SaaS. So they built this great product [00:05:30] and they want to bring their solution to the world and it really fixes a problem, but they just very often they have a technical background and they just don't know how to sell it. They didn't know how to bring it to the market and I've seen a lot of them actually crashing and dying with a great product and can actually help someone out. So I thought this was a really cool space to be in as I'm actually helping make a real difference for people. Sam Ovens:	And what was your previous [00:06:00] background? Pat Lavergne:	My previous job was head of sales actually for a SaaS company. So that's where I kind of took that. And other than that, I've been in sales for a long time and I have a background in finance and corporate strategy from school. Sam Ovens:	And what attracts you to SaaS? Pat Lavergne:	I think it's the scalability. So SaaS can actually change the world for the better. A really well carved out SaaS can actually [00:06:30] make that big difference. And the fact that technology is forcing us to adjust and evolve ever increasingly and I think SaaS are actually a great model to kind of follow that trend. So that's what's very appealing to me. Sam Ovens:	Got it. So you came from a background of SaaS and sales, so you're kind of interested in those and then when you came to pick your niche in the program, [00:07:00] you thought, well SaaS and sales, maybe we could do something here and then you would have thought like, what problems do these SaaS companies have? Pat Lavergne:	At first I was like, okay, maybe I help SaaS companies will have a team of salespeople, but they don't know how to optimize the productivity of the sales people. So that was one thing. So I'm like, okay, maybe I could coach the sales people and the team or maybe I could coach the sales leaders [00:07:30] or maybe I could coach the founders who are not quite at the point where they have a sales team. So I had all these different opportunities and this is where I was actually lost for the longest time. So even though you want to help ... Even right now I have three clients that I'm doing done-for-you consulting services and they're all in that niche, but they all have a little something different that they need. So for example, with one client, it's more about helping them profile the perfect first [00:08:00] sales hire and coming up with the right key performance indicators to make sure that that person is going the right direction. Where for someone else it would be more about helping them with the sales funnel. So how do you find leads? How do you qualify them? How do you pitch them your services? How do you close them? So it's really easy to go in multiple directions and I think the challenge is to actually bring it more in a way that you can actually help people, but in a way that you [00:08:30] can scale it. So having more similar, I guess, projects. Sam Ovens:	Got it. And you said the problem for these SaaS companies is they typically solve a problem in the world and they've got a product that exists, that can solve that problem, but they kind of break down because they don't know how to sell and they're not very good at making that known to people. [00:09:00] Why is that? Pat Lavergne:	I think people underestimate the business development or the customer acquisition aspect of the business. So they sometimes, they have a very technical profile, so they're great devs, they will develop an amazing SaaS and sometimes they're a little bit in their head so they're really excited to talk about all of the features and the bells and whistles of their product, [00:09:30] but they're having a hard time connecting with who is actually going to help and how it's going to help them. And sometimes it's as silly as being afraid of picking up the phone and reaching out to their potential clients and it's helping them with that as well. Sam Ovens:	Got it. And why do you think they're afraid and they've got friction around this thing? Pat Lavergne:	Great question. So for some of my client it's just unknown, it's just something they've never done before and they don't consider themselves capable of doing it. So a little bit of [00:10:00] the mindset work here, where for some others it's more practical in the sense that they ... Since they've never really done it, they're trying to do it, but they don't really have like a process in place that will help them be successful doing just that. So they're a little bit like adduct for example. They'll put a post on LinkedIn and they're hoping that they will get some clients from just a post on LinkedIn and so they're expecting that people will just go on their website and just reach out to them and when it doesn't happen, this is where they're a little bit lost [00:10:30] and they need guidance. Sam Ovens:	What other things do they typically do when they're trying to solve this problem but are failing to solve it? Pat Lavergne:	I'd say most of my clients actually tried working with other companies that helped them by sending them leads. So this is something that works for some, but for my clients, the problem was they were investing to get those leads, but again, they don't know what to do once [00:11:00] the leads come in. So for example, I know a lot of people out there, when they get a lead the thing they do is they would send a brochure by email saying, "Hey, this is what we do and if you're interested, this is how you pay it. Super simple." But there was no value that was built in. There's no listening to that customer's pain points and connecting the pain point with how the technology will actually fix their problem. So this is something that I've noticed as well. Sam Ovens:	So they get too [00:11:30] carried away with the technical front and kind of explain that without explaining how that meshes with the problem to solve it and bring value? Pat Lavergne:	Exactly. Yeah. Sam Ovens:	Got it. And then ... So I get it how you were interested in this area and you had previous knowledge in this area, in the background, so that made sense for choosing that niche. You didn't explore this niche, you found out that they had a problem. Then how [00:12:00] did you know that you would be able to solve their problem and how did that they'd be willing to pay you money for your services? Pat Lavergne:	That's another part where I had a lot of problem, I still struggle to this day. For me it's easier to find client then to make sure that I'm actually over-delivering on what they need. So that fear is what actually drives me the most, is making sure that [00:12:30] once a client is secured, like, okay, now it's go time and let's make sure that they're being successful. So when I started I was like, actually, even though I've been in sales all my life, selling someone else's product is one thing, but actually putting yourself out there and the product or the service is just my brain and my own expertise. That was something a little bit different. So when I started I went out with a really low price for my services, almost ... [00:13:00] Well, pretty much devaluating myself. And it's funny because the first maybe seven or eight calls that I made with potential clients that I found, the call was going good or great and then I got to the end where they were like, "Okay, cool. So how much does it cost?" And then I would say the price and I could see it, they could almost laugh in my face. They were like, "Oh, okay. That's not serious. The price is so low that I'm not willing to entertain this any longer." So [00:13:30] I had to basically man up and just better rethink my pricing. Sam Ovens:	What was your price? Pat Lavergne:	My price was $2,000 for like a 30 day done-for-you sales game plan with the playbook, the scripts, a lot of the stuff that they needed to really be successful. Sam Ovens:	Got it. So you would get them interested, get them on a strategy session, tell them what you're going to do and then you thought that they [00:14:00] thought that you weren't credible because your price was low? Pat Lavergne:	Yeah. That's what I felt. Sam Ovens:	What did they say though? Pat Lavergne:	It's more the reaction, I'd say, that they ... It was like this little bit of an awkward silence and they'd be like, "Okay, so the $2,000 is per month?" And I was like, "No, it's for one month and we do 2,000 where basically I'll take care of everything we just talked about, which really touches on where you're at right now and it's gonna help you get to the next level." And they were like, " [00:14:30] Well, okay. But that's a lot. You're offering a lot for the price that you're going for. So this makes me doubt you a little bit, to be honest." Sam Ovens:	That's what they said? Pat Lavergne:	Yeah. Sam Ovens:	Got it. And then how did you react to that? Pat Lavergne:	Thankfully I recorded all the calls whenever my potential clients accepts and by listening to those calls and talking to some people in my network, I realized [00:15:00] that because basically I kind of started by going with a model of like, okay, I'll need this many hours. And I was basically just trying to sell on an hourly wage instead of selling on or pricing on the problem that I'm fixing and the results that my clients would be getting. So it made sense, if we could say that, with the hourly wage way of seeing things, but it really didn't make sense when you look at the value that I was [00:15:30] bringing. Sam Ovens:	Got it. So what did you do next? Pat Lavergne:	The first thing I'm like, okay, this doesn't make sense. So I basically went in my network here in Toronto, Canada. I know quite a few SaaS companies and I just basically, I went for coffees showing them, telling them about the problem I was trying to fix a and then the offer that I had in mind that I wanted to bring to fix the problem. And then I just [00:16:00] asked them like, "Hey, I'm not trying to pitch you anything, but how much do you think this is worth?" And I was getting answers from anywhere from 5,000 to $10,000. So like, okay, so even though I was still a little bit fearful, so I went to the lower bracket of what I was getting which was $5,000. And then I went back to my attack plan and then very quickly I got three clients like let's say in a span of two or three weeks. Sam Ovens:	At what price? Pat Lavergne:	At $5,000. Sam Ovens:	Got it. And it was the same offer. [00:16:30] Exactly the same. Same marketing methods, same lead gen, same core process and everything? Same offer, but just a different price? Pat Lavergne:	It was the only variable that I changed. I can attest to that. It's crazy. Sam Ovens:	That's interesting. And then let's talk about how you got those calls because we've talked about how the call went [00:17:00] and what your offer was like and how that was priced and changing the price and how that affected things. But how did you actually go about generating the calls? Pat Lavergne:	I've been relying a lot on direct outreach with LinkedIn and also AngelList. So I think LinkedIn, everyone knows, but AngelList, for those who don't, would be a website where a lot of tech companies go, especially startups to [00:17:30] hire a ... They go there to put their profile. So they're looking either for co-founders, investors or employees. So they go there. So what I actually did is I tried profiling my targeted client. So I just went on the website and I was looking for all of the SaaS companies that were maybe from one to 10 employees and that were either looking for a co-founder that would take care of their sales or a first sales hire because I figured that [00:18:00] that's exactly the point where I think I can come in because if they're already have a head of sales, then my consulting kind of overlaps with what the head of sales is supposed to be doing anyway. So I didn't want to go at that stage and so I was trying to get them more at the earlier stage. Sam Ovens:	Got it. Pat Lavergne:	So basically I just reached out. I go on AngelList, I find a CEO, I go on LinkedIn, I approach a CEO with basically [00:18:30] a message attached to a connection invite, and then it becomes a numbers game. So basically you reach out to 100 of those, about 30 will accept your invite. Then you follow up with like a little bit of a value post like a day or two after. So value posts being trying to figure out like what they would like to see in a message. So for example, if I know that they're there were looking for their first hire than I'd say, "Hey, when it comes to a first [00:19:00] hire, what are you looking for?" And then some people would just reply saying, "Actually I don't really know what I'm looking for, do you have any insights on that?" So this is our would spark conversations and I would bring it to like a strategy sessions or a shorter phone conversation. Then we'd chat a little bit and this is where I would close them. Sam Ovens:	Got it. And then you used AngelList, which is interesting because that is where your market hangs [00:19:30] out. So for people listening, this is the power of really defining your niche and knowing your niche. I mean, you chose SaaS companies. So you defined that. Then you're at where SaaS companies hang out, well, AngelList, probably more so that than Facebook. So you go there and then you had to further profile your niche because there's a lot of SaaS companies. You could call Oracle a SaaS company, you could call [00:20:00] Apple a SaaS company. And then there's tiny little SaaS companies. So how did you profile that? What is your ideal client? Pat Lavergne:	First thing I'd say is it didn't happen from the get go. It's not like I sat myself down and I knew exactly what to go for, even if I was working for a SaaS company, but it was mostly by talking to people and in retrospect, when I would analyze my calls I'd be like, "Oh, okay, this call was a little bit awkward [00:20:30] because I don't know, they just raised like a lot of money. They raised millions of dollars and now they really want to hire that head of sales and nothing's going to happen until then." So all of these calls that I made or all of these reach outs basically every time someone would give me a piece of information I would use to further niche down. So I got to the point where I know that my perfect persona would be the SaaS startup founder [00:21:00] who doesn't have ... So he's very technical, doesn't have a sales background and maybe raised seed money but no more than seed money. So has a little bit of money and are at a point where they closed less than 10 deals. So maybe friends of friends. They used their personal network to close a few deals, but now they're at a point where they don't know anyone anymore, but they still want to kind of like learn it by themselves because they don't have enough money in the bank to make a big jump and [00:21:30] do like big marketing, unfold a big marketing strategy or hire that head of sales. And there's a gap there. And I want to help fill that one gap and I want to bring them to where they'll have enough money to really get to the next stage and then the next stage. Sam Ovens:	Got it. That's really clear. That's good. That makes it, your job very easy. I've been in that position myself because I had SnapInspect, a [00:22:00] SaaS company ages ago. I started a SaaS company and I had to do all of this stuff. So I actually can resonate with what you're saying. And then let's talk about what you're actually offering these people. So at the beginning you said you were offering done-for-you, right? Pat Lavergne:	Mm-hmm (affirmative). Sam Ovens:	What were you saying, promising that [00:22:30] you would do for these SaaS companies? Pat Lavergne:	So this is where it got really customized in a sense that I would use the first phone call, the strategy session, to really dive and understand the problem. So that's the first part, understanding the problem. So they'd say, "Patrick, I'm spinning my wheels, I'm not selling anything and I'm going crazy and we need to figure a way to sell stuff." And then I would ask questions such as like, a lot of follow up questions, like, "Okay, what [00:23:00] have you tried?" And then we'd go on a tangent and we'd figure all of the blind spots, all of the areas where they needed help when it comes to their sales strategy. So I would really focus on the sales because I know what I'm not good at, marketing for example. I'm not a great marketer, I'm not even a good marketer. I'm great at sales. So with everything marketing, I was very upfront with them, letting them know that this is something I could not help with, but when it comes to sales, when it comes to validating or building [00:23:30] an organic sales strategy to at least get started, get bootstrapped and find these first initial deals, this is where I could help. Sam Ovens:	Why do you think you can't do marketing? Pat Lavergne:	At this point, this is something that I haven't developed myself, so either I learn it or I partner up with someone who's really great at it. I'm enjoying it doing it for my own practice, but I wouldn't say I qualify as great in marketing yet. Sam Ovens:	[00:24:00] Because marketing is just sales really. Pat Lavergne:	Yeah, I guess you're right. It's more when I look at everything like digital marketing, even like the Facebook ads, which is something that I'm looking forward to actually attacking in the program, but it's something I haven't done yet, so I've been holding off because I'm still on the organic part of it. You're right. Maybe it's a mindset issue here that I have. That's quite possible. Sam Ovens:	Yeah, because that's how you become like full [00:24:30] stack with helping them, because then you'd have the SaaS understanding side and then the sales side and the marketing side, and then it'd be like meeting God for a lot of these people. Pat Lavergne:	Absolutely. Sam Ovens:	Because right now that's the next missing part in the stack. I just found that interesting. That's what I would definitely be learning if I was you, because that would make you way more powerful. Pat Lavergne:	I completely agree. [00:25:00] And a lot of my clients will be like, I know it's a little bit they're like, "Ah, I wish you were good with that too, but okay, cool. Take me as far as you can with the sales." So for example, right now, I'll take them to a certain point, but then once we want to make everything fully automated and bring leads in an automated fashion, that part, that lead gen part that's fully automated, we know we'll need help, we'll need someone else to help them out. Sam Ovens:	Got it. So let's say, I'm just trying to imagine this in reality, [00:25:30] there's a SaaS company, are they typically be like business to business sort of apps or they're consumer apps or enterprise? Pat Lavergne:	So mostly it would be B2B, so business to business, and we'd be looking at average deal size of my clients would be anywhere from 5,000 to $50,000. Sam Ovens:	Per year? Pat Lavergne:	Per deal, per year. [00:26:00] Yeah, exactly. Sam Ovens:	So there are like enterprise things. Pat Lavergne:	Yes. For some people enterprise would be much larger, but we can say enterprise. Yeah. Sam Ovens:	Because 50k for some SaaS is pretty expensive. Pat Lavergne:	Yeah. Again, I'm in Canada, so you're right, in Canada it can be quite expensive, but in the States, for example would be a little bit different I guess. Well, you can tell me, you're in [00:26:30] the States. But yeah, it's just labeling at this point. Sam Ovens:	There's only really one software we have in our entire company that costs us more than 50 grand. Pat Lavergne:	Okay. Sam Ovens:	Yeah, yeah. Every other app we have and we got a lot of apps, there were way less than that. Pat Lavergne:	See, if you look at it that way. Absolutely, you're right. Absolutely. Yeah. Sam Ovens:	Because that changes things even more because you're really trying to look [00:27:00] for SaaS startups that have raised some money but not a huge amount of money and they need to get customers in order to validate it to investors to get their big round of money and they're not the best at sales and marketing. So they're kind of stuck there. There's no kidding they need to cross this gap. But also they have a SaaS product that is sold to [00:27:30] larger businesses and has a big deal size kind of nature. For example, this wouldn't be like, you're not really helping someone like MailChimp, you know? Pat Lavergne:	No, exactly. Sam Ovens:	What sort of SaaS services are these things typically? Pat Lavergne:	So right now I could say an HR tech SaaS for example, that helps organizations be [00:28:00] healthier. They kind of attack the wellness space. Another one would be in the cannabis industry, which is getting legalized very shortly here in Canada. So a SaaS to help some players in that industry. So other than that, there's assassin marketing as well. For some reason one's escaping me, but yeah. Sam Ovens:	Good. So they're typically, they're [00:28:30] not SaaS applications for smaller businesses? Because I guess with the smaller business, you almost don't need a sales team because you can just do the free trial, the automated charge the card thing or upgrade and maybe you have like intercom chat on there and you can pretty much streamline it and automate it. So you're dealing with SaaS applications that pretty much need ... Like instead of having the free trial, they might [00:29:00] have book a demo or something? Pat Lavergne:	Exactly. You got it right. You got it perfectly right. So anything under $3,000, it's very hard to build like a sales model with insight sales people for example, because the average size deal is too low and then you can do just a fully automated process where people will just watch webinars by themselves and just sign up by themselves in the website. I'm attacking the market where actually, [00:29:30] we need to get them on the phone and we need to do a demo or we need to prove the value because people are afraid of putting 20, 30, $40,000 unless your name is Google, then you can pull it off. But for most of the other SaaS out there, they actually need to talk to their potential clients. Sam Ovens:	Do all of these people websites generally say the same call to action, like book a demo? Pat Lavergne:	Interestingly, most of my clients and potential clients, they're not at that point yet. So that's [00:30:00] like a quick win that we can actually do with MC. So it's actually showing them that they can optimize the website to- Sam Ovens:	What does the website say when you typically find them? Pat Lavergne:	It would be just a contact page- Sam Ovens:	Seriously? Pat Lavergne:	Yeah, they expect people to go on the contact page. Sam Ovens:	So these are- Pat Lavergne:	What's that? Sam Ovens:	How does someone even think that? Pat Lavergne:	Well, that's the thing. So when [00:30:30] I catch them, they're just done building the SaaS but they haven't gone through the pain of multiple months of not selling anything. They're just in there and they're looking for answers and I come- Sam Ovens:	But what would this mean, that someone can build an application that works and makes that mistake? You know what I mean? Pat Lavergne:	I know. It's crazy. And it's funny because on those calls are super excited about telling me about their SaaS and the great tech stack, the technology and everything, but they're pretty much all in their head. It's all about [00:31:00] their technology and there's these huge gaps in basically their sales and marketing strategy. Sam Ovens:	It's interesting. So you could ... Yeah, you could almost build like an AngelList scraper sort of thing that would pull all the domains of all of the applications and then crawl all of the [00:31:30] sites to look for the presence or absence of book a demo or free trial. And then you could find the ones where there is no free trial and there is no book demo. And then that would probably find you your guys. Pat Lavergne:	Absolutely. That's a great idea. And also even those who have a book a demo, I actually one day just for fun, I kind of reached out to 20 and, and I filled my contact information in the book a demo and [00:32:00] I'd say more than half didn't even get back to me because it's just the founder himself and he's swamped and he's probably busy on other stuff. So they're not even acting when leads come in. That's another part of the problem. Sam Ovens:	Yeah. Well you could find and pull a list of all of the ones that don't have any pretrial or book a demo or the ones that just have book a demo and then ... Yeah, that could be a way that you could [00:32:30] quickly do the leads instead of doing it so manual. You know what I mean? Pat Lavergne:	Absolutely. That's a great point. Sam Ovens:	And then, once they signed up with you, what work did you typically do for them? Pat Lavergne:	Right now I've got three clients and it would be, like I said, a 30 day project. So usually I scope them for 30 days and we [00:33:00] basically agree on the deliverables. So for example, for one client it's helping them figure out who they should hire to kind of start their sales team. So they're at a point where they didn't make enough sales on their own. So mind you, everything we talked about when it comes to niching, like it's not perfect with my first three clients. Everything I told you I learned as I went along. So right now I've got some clients that are not necessarily exactly where I need them to be. So one of them would be helping them [00:33:30] figure out who they should be hiring, what should they be doing in their day-to-day, how should they be tracking for success? So what's the benchmarks when it comes to the number of calls they should be doing in a day and the conversion from calls to demo, demo to closed deals and stuff like that. For someone else it would be more about the buyer's journey. So understanding their potential buyers when they're talking with them or interacting, where they're at in their head and how they can provide value. So mapping [00:34:00] out these things. Helping the founders, educating the founder on this and again, being fully customized. Basically the recommendations I make will actually help them build that marketing collateral they need to nurture their leads and educate the market. So that would be something else. And for the cannabis industry, client that I have, since it's a brand new industry, they really don't know how to attack the market, how to even find [00:34:30] their niche. They kind of had an idea of who they wanted to service, but that really changed with the help with me and now they're much more focused. But now we're at the second part of the project which is, well how do you connect with these people when it's all hush hush here in Canada and you don't even know where they're at. So that's something else. So you can see how different they are, but what they have in common is they're all SaaS companies that actually need help with scaling the sales. Sam Ovens:	Got it. And then you said [00:35:00] that you started doing done-for-you and you did what, two clients done-for-you? Pat Lavergne:	Three clients done-for-you. Sam Ovens:	And then you changed to a one-on-one kind of coaching? Why did you do that? Pat Lavergne:	Well, maybe silly me a little bit, but to get my three clients, I did maybe 30 calls with potential clients and I must have turned down maybe five or six potential clients who were in my niche, but they were [00:35:30] like, "Hey, the done-for-you thing you're offering is great, but that's not really what I want. I'd prefer having like a phone call once in a while or maybe even like recurring phone call where I can just pick your brain and we just chit chat and that'd be it." And I refused those because I thought I had to really double down and be really precise on what I'd be offering. And it's funny because ... So I refused all of those potential clients because I felt I wasn't ready to do the one-on-one coaching. [00:36:00] And then one of the mistakes I made right before going into the accelerator program and after leaving my job was as soon as I left my job, I thought I needed a branding and logo and website, fancy website. I didn't even know what I was doing. So I hired some people that I know to build me a website and a few weeks ago I still owed them a little bit of money. And they're not necessarily SaaS, but they're like a new marketing agency and they sell websites. So I reached out and I said, "Look, I can either pay [00:36:30] you or I kind of like to branch off maybe into one-on-one coaching and would you like me to do that with you? Would you like me to coach you?" Because he was telling me how he was having a hard time finding clients. And I thought, "Okay, it's not nice, but at least it's going to show me if I can bring value doing one-on-one coaching." So yeah, that person jumped on the offer and we did a coaching call and it went really well. And then I picked up another client to do some coaching and [00:37:00] I really like it and they like the ... I don't know, the feedback I get from it is really good. I think the model lends itself better to actually scale. So yeah. So now I'm thinking of actually finishing up my done-for-you, but slowly transitioning into one-on-one coaching. Sam Ovens:	Got it. And then what's it been like, the contrast between a done-for-you and the one-on-one coaching? Pat Lavergne:	[00:37:30] On a personal level it's kind of weird because you finish the coaching call and you're wondering if you gave enough value or are you like, okay, I didn't do nothing, but I can see how this can be helpful if they take it and run with it. So to help with that, basically at the end of the call, what I do is I basically build an email with the key takeaways of the coaching call, the action steps that they should be taking [00:38:00] and I send them the recording of the call as well and I ask them some feedback, like EMPS questions. So for example, on a scale of 0 to 10, how likely would you refer me to your friends and family? And then I'm trying to get a good enough score. And the feedback has been really good so far. So that's how I know that I'm on the right track, but back to your question, like the differences, it's more like ... I don't know, it's more in and out. I'm there to really answer all their questions. The [00:38:30] next step would probably become building like an accelerator program or something like that and bundle it like a 13 week or whatnot. But for now it's mostly more punctual coaching calls. Sam Ovens:	Got it. And then your price for the coaching calls. What's that? Pat Lavergne:	So again, right now maybe too low. Right now I'm at a $300 per hour. So that's how I price it for now. Sam Ovens:	[00:39:00] And you sell that different compared to the five grand thing? Pat Lavergne:	Exactly. Sam Ovens:	Isn't it preferable for you then to have the five grand sale compared to $300 per hour? Pat Lavergne:	Short term, yes. But I don't see myself staying at $300 per hour. I really see myself building a program that will be $5,000, but instead in that program they will have, for example, 13 coaching calls like so for 13 weeks and then ... So I try [00:39:30] not to make a business decision on something ... I'd rather do something that's not scalable to learn and to see if I actually can deliver value and if they like it. And then I'll find a way to make it scalable and make it worth my while, all the while giving the value. So I don't really concern myself with that for the next month or two, I'd say. Sam Ovens:	Got it. So what is your plan [00:40:00] for the future? Pat Lavergne:	Short term over-delivering on my done-for-you clients. Probably I have two out of three would like to continue in some fashion, so I'll try to see if there's a win-win situation there. So that's one thing. I would like to have, bring onboard like 10 coaching clients, really test this out, really improve the offer on that level. [00:40:30] Don't have to wait until the 10th client to really bring up my prices to your point. But I really want to test this out and throughout the coaching with these 10 people, I'm gonna ... On the side I'm going to be building the accelerator or the program. Sam Ovens:	Got it. And then what about long-term, like 10 years from now, what do you envision with this? Pat Lavergne:	So a really unpopular answer here, but I'll say nothing. I'm not quite good at that. [00:41:00] So I don't see much. I see working in Portugal during the winter because it's really cold here in Canada and I see great work-life balance in a sense that I'm not a nine to five guy, far from that, but I'd like to have the freedom of actually being able to bring some stuff in my life. So for example, I don't have kids yet, but once I will have kids, I want to be able to kind of fit that in, in a way that's actually [00:41:30] better than being in a corporate world. So I know what's in the corporate world, so I'm trying to have something that suits me more, suits me better when it comes to the lifestyle and the impact that I'm having. Sam Ovens:	Got it. And then what would you say has been the most transformative part of the Consulting Accelerator program in your experience? Pat Lavergne:	For me it was actually showing me where I was standing and then showing [00:42:00] me where ... It's weird. I guess it's the esoteric part of the interview, but everyone in the Consulting Accelerator is vibrating in a much higher frequency and I was just like lost and playing a small game and it was to prove myself that it was possible to really be successful even though I wasn't a consultant for a long time or even at all. So basically [00:42:30] that was the biggest one for me, I guess, the mindset element to really bring myself up to speed and believe in myself and actually provide value for people. Sam Ovens:	Got it. So being around a lot of people who were starting their own businesses and already had started their own businesses, that changed your state? Pat Lavergne:	Absolutely. Absolutely. Sam Ovens:	Got it. And then what would your number one piece of advice be for [00:43:00] other members who are going through the program? Pat Lavergne:	For members who are already in the program? Sam Ovens:	Yeah, like people who are just starting out or maybe they're struggling at any point in the process. What would you say to them? Pat Lavergne:	Stop trying to have it perfect before actually taking massive action. For me, the moment I decided to take massive action, so meaning every day like hitting my numbers of [00:43:30] people to reach out on AngelList or LinkedIn, even though I didn't have anything figured out or hardly, this is what I think will drive results because if you stay in your head and you try to have it perfect, you'll always niche jump, you'll always doubt yourself and nothing is actually going to happen. So taking action is actually way more important, even if your planning is not that great, than having a perfect game plan but not doing anything. Sam Ovens:	Got it. And then, how can people learn more about [00:44:00] you? We're going to put this on YouTube. So non members will be able to see it too. If there might be some people who have a SaaS company or who know people who have got a SaaS company and they need help with sales, how can they learn more about you? Pat Lavergne:	Simply go on the website. So it's Pat at PatLavergne.com and I'll go over comment. Wherever you post this, I'll be there so people can connect with me on Facebook or LinkedIn as well. Sam Ovens:	So [00:44:30] PatLavergne.com. Pat Lavergne:	Yes. Sam Ovens:	L-A-V-E-R-G-N-E. Pat Lavergne:	Exactly. Yeah. Sam Ovens:	Cool. Awesome. Well, thanks a lot for jumping on and sharing your story. I'm sure it's going to motivate and inspire a lot of other people. Pat Lavergne:	Thanks for having me, Sam. Sam Ovens:	Awesome. We'll speak soon. Pat Lavergne:	Bye.